An international outsourced support provider is ideally an extension of your workplace. You can obtain strong client acquisition & retention rates by hiring these call centres. Here, administrative, non-core & routine business functions are handled by specialists who are duly trained and certified. 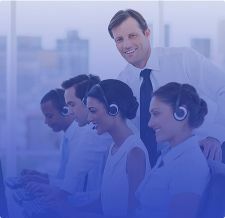 Avail unmatched inbound call centre services that are suitable for large enterprises as well as SMEs. Out team of outbound call centre consultants will prove to be your best outsourcing partner. With Go4customer\'s most comprehensive portal, you can leverage exceptional client experience within your budget. Our global delivery model helps you to reinforce your relationship with customers. We provide highly responsive and effective customer support outsourcing services to ensure the smooth operation of your business-critical operations. With customer-centric approach and 24-hour assistance, we stand amongst the top call centre outsourcing companies in Australia. Go4customer offers an extensive gamut of outsourced call centre services to meet the requirements of B2B businesses in Australia in strict compliance with the international standards. Owing to our domain know-how and illustrious experience, our call centre outsourcing solutions provide a phenomenal service experience to our corporate clients. So, if you are seeking the best customer service assistance or a competent business outsourcing vendor in Australia, Go4customer is your have-it-all brand. We provide professional call centre services that offer a superlative customer experience. These are time tested web solutions that help to drive your business further ahead. For an overall growth, businesses require exceptional BPO services. Our diverse business process outsourcing services help your company to develop, implement, and sustain a growth strategy without any risks. USA, UK, India, and Australia based centre agents handle inbound calls, chat and email with utmost care and professionalism. We deliver unmatched and seamless outbound call centre services such as lead generation, third party verification & telemarketing. Through a collaborative approach and customer-driven focus, the experienced teams of professionals in our company drive instant impact to accomplish targeted results.